Today you may have to reconcile yourself to the fact that good things come to those who wait. You may be frustrated over something that’s taken longer than expected to materialize — such as a job, promotion, relationship, financial security, etc. The Hanged Man refers to delays and obstacles, but often these are necessary — even if you don’t yet understand why. 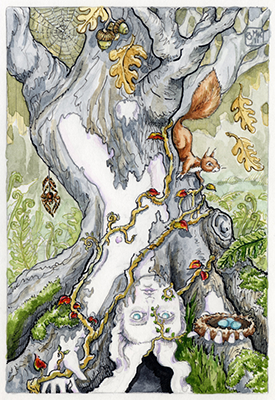 In this version of the card we see an old tree with a human face and twisted branches that appear to be taking on a human form. Moss grows on the tree’s roots and acorns grow from its limbs. Vines are also wending their way up the trunk from one of the tree’s “hands,” while a bird’s nest rests in the other. This tree has become “home” to a number of woodland creatures. In addition to the family of birds, there’s a squirrel scampering down one side and a spider and web on the other. The Hanged Man refers to sacrifices as well as delays. Most often this is necessary and is for the greater good. We can see that this is the case with our tree. If it’s a tree taking on human form, it’s doing so over many many years, providing a safe haven for animals in the interim. And if it’s a human who’s forfeited his physical body to become one with the forest, then he’s made the ultimate sacrifice. Think about the areas in your own life that have taken longer than expected to manifest. There may be a perfectly reasonable explanation, or it may be that there’s still work to be done. Either way you can rest assured that the reasons will become clear to you in time. The card used for today’s tarotscope is part of the 22-card major arcana Stolen Child Tarot series by phenomenal artist Monica Knighton, creator of the Tarot of the Dead. The Stolen Child series is based on the William Butler Yeats poem of the same name. This labor of love was made possible through a successful kick-starter campaign. Monica sells this, as well as individual prints, through her Etsy storefront. Please visit and “like” her Facebook fan page! Used by generous permission.